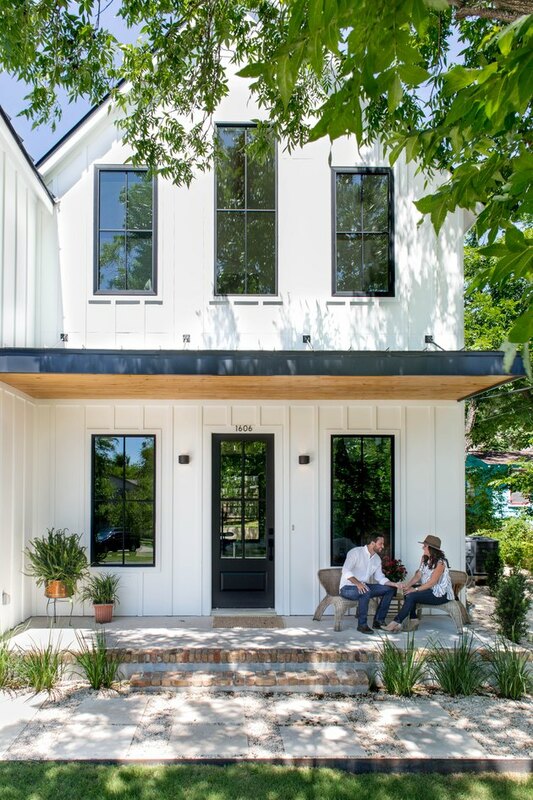 When it came time for a young couple to build their dream house in Austin's hip Bouldin Creek neighborhood, they knew they wanted a classic Texas farmhouse — but with plenty of contemporary twists. With the help of Frank and Megan Lin of local architecture firm co(X)ist Studio, the couple — an aspiring interior designer and a startup executive — were able to create a modern farmhouse just in time for the birth of their first child. The architects incorporated reclaimed materials throughout the home, bringing a sense of history and patina to the new build. When it came to creating the layout, the Lins took a mathematical approach. "There is a careful consideration of proportion throughout the home," said Frank. "The Golden Ratio was used to create harmony between the spaces of the home and its surrounding neighbors." The exterior is a nod to the traditional farmhouse style but has an updated and streamlined look that allows it to blend in with the modern homes currently being developed in the area. The final product was the perfect fit for the neighborhood and for the new family of three. Because of the home's narrow site, the architects had to carefully consider the layout, which needed to fit the lot, but also needed to maintain privacy. The entry is shaded by a galvanized steel canopy, a modern take on a farmhouse front porch. The sunny foyer offers a warm welcome to the home. 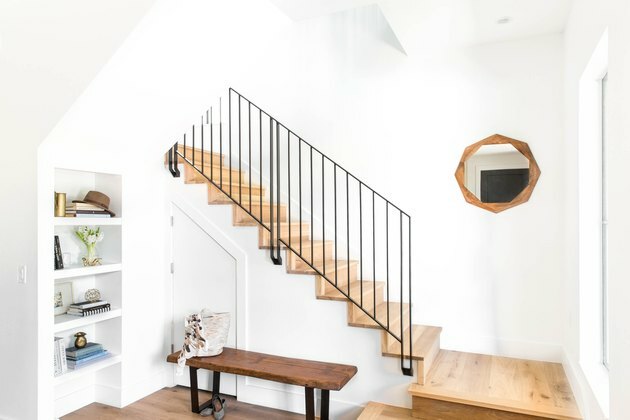 A sleek, galvanized steel handrail contrasts with the bright white walls and wide-plank wood flooring. The living room opens onto the deck, which extends the length of the house. 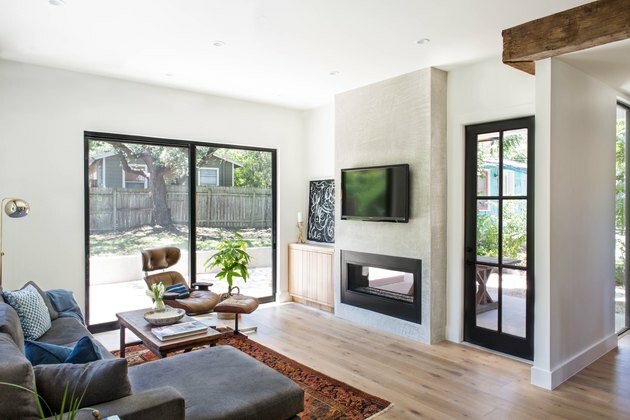 A double-sided fireplace adds to the connection between indoors and out. Reclaimed wood beams and a zinc-clad range hood add a rustic vibe to the clean-lined kitchen and dining area. The family room's vaulted ceiling is accentuated by a reclaimed wood beam. The space sits between the master bedroom and the other two bedrooms, creating separate wings. 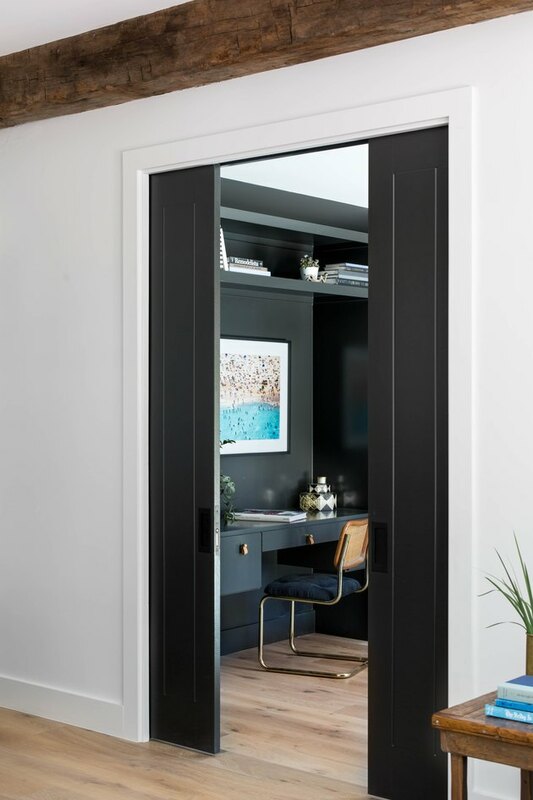 Pocket doors open to reveal the office/library where the black built-in desk and storage create a sleek workspace. The minimalist master bedroom is a serene escape for the new parents. 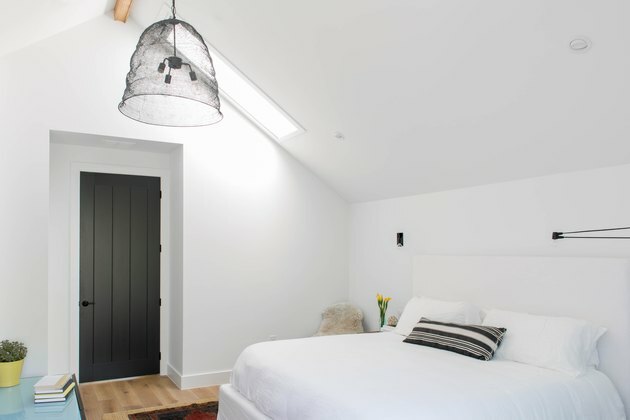 The black door, wall lights, and mesh pendant light add depth to the otherwise crisp white space. 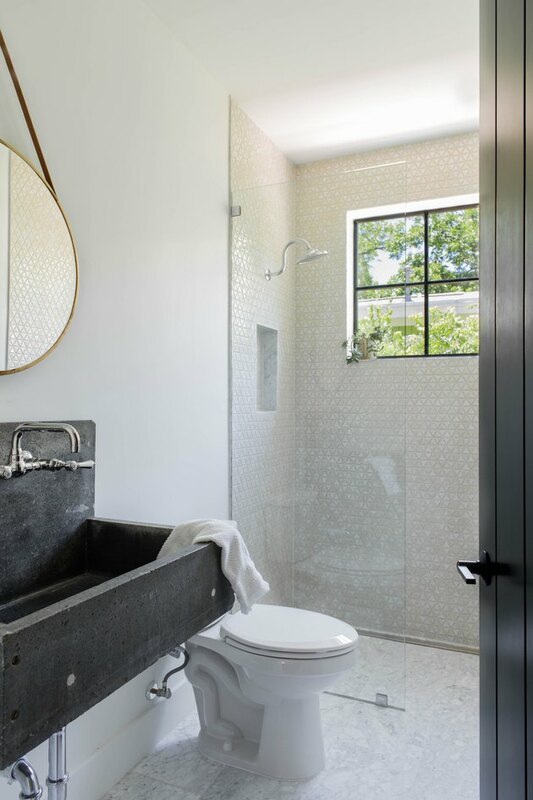 A graceful pendant light hangs above the footed soaking tub in the master bathroom. The floor is paved in Opustone Arabescato Bianco tile and the vanity's Vox sinks are by Kohler. The charming nursery is filled with cozy patterns and textures. 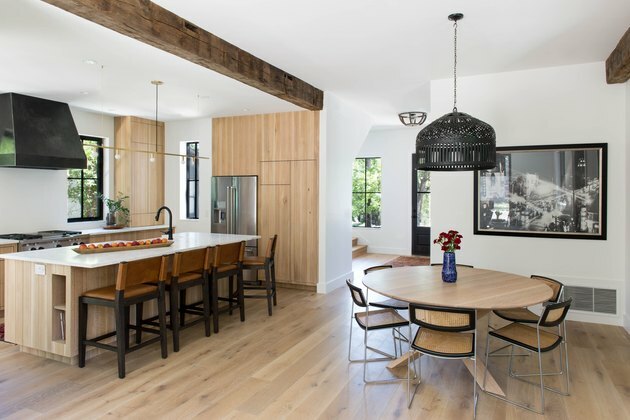 A reclaimed beam and industrial-style fan highlight the high ceilings. A reclaimed sink is the centerpiece of another bathroom. The shower is lined in Lyric Retro Treble Glazed triangular tiles.